Call to Order – Chairman Jacob called the meeting to order at 7:00 p.m.
Review of Minutes of Oct. 8, 2013: Motion to approve by Stan Stubbe, seconded by Karen Nocella. All in favor. Treasurer’s Report: Checking $1,078.12, Savings $8,055.33, Total $8,826.70. There was one expenditure for $120 for secretarial services and $186.75 to Wordsworth Communications for website renewal. Motion by Lisa Lacroix, seconded by Karen Nocella, to approve treasurer’s report. All in favor. Discussion: There was discussion of a conflict between the December N. Federation meeting and a West Pikeland regional meeting regarding the gas pipeline. Motion by Stan Stubbe, seconded by Karen Nocella, that the December meeting of the N. Federation will be cancelled. All in favor. A discussion of the draft copy of By-Laws previously approved by 4 of 5 member municipalities took place. 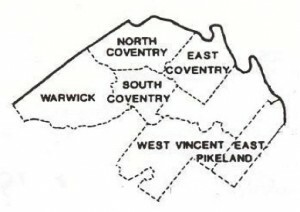 North Coventry did not approve the By-Laws due to an objection to Article III. After discussion by Charles Jacob with two separate legal consultants, it was determined that Article III is legally unnecessary to the continuation of the organization of the Federation of Northern Chester County Communities and will be removed. The redrafted By-Laws document will be returned to the member municipalities. If a majority of members return documentation attesting to their willingness to accept these By-Laws, the Northern Federation will adopt them at the January meeting. Motion by Stan Stubbe, seconded by Lisa Lacroix, to return the draft By-Laws to member municipalities along with a letter explaining the final change to the document with instructions to resign and return to the N. Federation. All in favor. There was discussion of a proposal by Northlight Advertising to redesign the existing website northernfederation.com. A summary of the proposal will be sent to all N. Federation delegates. Competing proposals may be submitted through December 31 for consideration at the January meeting. Northlight Advertising is a local business and has experience working with other local businesses and conservation organizations. An example of their work may be viewed at wplandtrust.org. Announcements: Joanna Furnace will be the site of Hay Creek’s 2013 Christmas. Admission is $5 for adults, children 12 & under are free. Details are available at www.haycreek.org. There being no further business, a motion was made by Stan Stubbe, seconded by Karen Nocella to adjourn at 7:50 p.m. All in favor. Next Meeting: Tuesday, January 14 at 7 p.m. at the Warwick Township building.